Zelda: Breath of the Wild has a special treat for those who clear the game’s new DLC. After completing The Champions’ Ballad, players will be rewarded with the Master Cycle Zero. Yes, Link can ride through Hyrule on a motorcycle. At The Game Awards on Thursday night, Zelda series producer Eiji Aonuma and Breath of the Wild director Hidemaro Fujibayashi spoke more about the DLC. The two developers explained how the Master Cycle Zero came to be, and also discussed the new horse gear. First of all, thank you for taking time to talk to us. And congratulations on winning Game of the Year for The Legend of Zelda: Breath of the Wild! 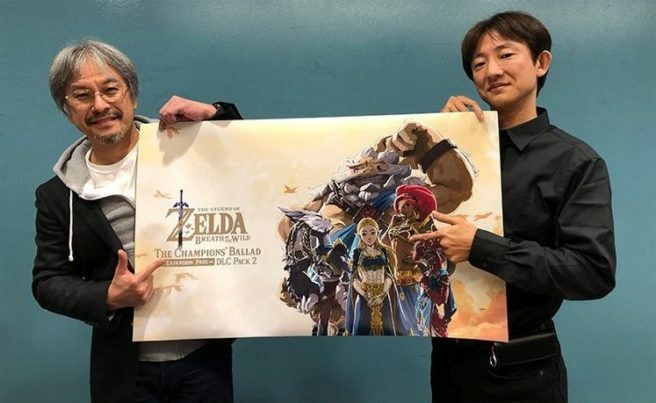 Aonuma & Fujibayashi: Thank you very much! Many fans were surprised with Link’s new ride in DLC Pack 2. Could you please give us the background on this vehicle? As Mr. Aonuma said, the functions of the motorcycle are amazing, so I was wondering if the motorcycle can enter the world of BotW without breaking the game. Around the same time, we were discussing what would make the best reward or item players can get at the end of DLC #2, and this idea clicked perfectly. Can you talk about the new horse gear in DLC Pack 2? Also, are there any horse gear designs or abilities that never made it into the game? Fujibayashi: There is both an ancient saddle and bridle. The saddle allows the horse to warp to Link’s location when he whistles, as long as it’s in a good location to call them. And the new bridle increases its spurs. They are pretty convenient abilities. And no, this was our main horse gear idea. We design them based on their abilities, so we already knew that we could not add too many abilities. However, aligning the motorcycle, there was a request to upgrade the horses’ abilities. We thought warping may be possible with ancient technology. So the design is based on ancient gear.